This entry was posted in Async, C#, Portable Class Libraries and tagged async, Parallel, Parallel.For, PCL, Task, WhenAll on January 12, 2017 by pcmichaels. I’ve had a couple of problems recently, where I’ve had tasks or asynchronous methods and they don’t quote fit into the architecture that I find myself in. 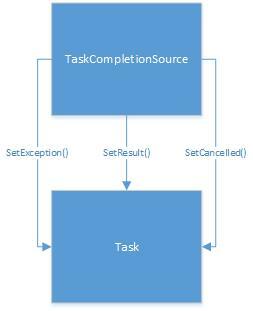 I’d come across the TaskCompletionSource before, but hadn’t realised how useful it was. Basically, a TaskCompletionSource allows you to control when a task finishes; and allows you to do so in a synchronous, or asynchronous fashion. What this gives you is precise control over when an awaited task finishes. Now the function will return when the the TaskCompletionSource.SetResult has been called. Potentially, a more real world example of this is when you might want to wrap an API in an async/await. The final scenario where this can be useful is where you either want to await an `async void` method, or where you have a specific part of a method or process that you want to await. 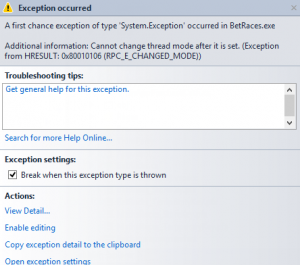 Imagine that BackgroundFunction is performing a long running task where a specific condition needs to return control. There are obviously combinations of functions in the TPL (WaitAll, WhenAll, WhenAny and WhenAll), however, these rely on the whole task, or a set of tasks, completing. Again, the below example is contrived, but it illustrates the granular control over the task that you have. I will re-iterate again, I realise that in the above example, there are better ways to achieve this, and the example is purely for illustration. Generally speaking, the simplest and most robust code comes from using the task architecture in the way it was designed: that is, use async / await inside a method that returns a Task. I’m not suggesting in this post that the methods I’ve described should replace that; but there are situations where that might not fit. Real life scenarios for using TaskCompletionSource? This entry was posted in Async, C#, Universal Apps, Universal Windows Platform, Windows 10 and tagged async, await, c#, SetResult, Task.Wait, TaskCompletionSource, Universal Windows Platform, UWP, Wait, Windows Store Apps on June 1, 2016 by pcmichaels. Drag: the start and end positions of the drag. 3. The Tap event fires, but a Double Tap doesn’t replace the Tap, so you get both. Why is it nullable? Well, this variable stores two separate states: whether the user is dragging, and where they started. I imagine the delay needs to be experimented with. 100ms seems to work for me. As usual, if you have any suggestions, comments, or ways to do this better then please leave a comment. This entry was posted in Async, C#, Game Development and tagged async, c#, Games, Gestures, Windows Store Apps, WinRT on January 26, 2014 by pcmichaels.